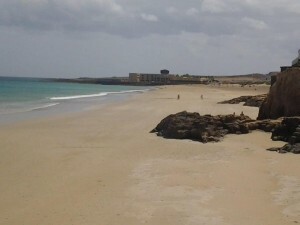 Playa Blanca was restored and improved in 2008 (fastening of dunes, furniture, ways of access), which turned it into an excellent option for the residents of Puerto del Rosario. It is a large beach, perfect for walks and relax. It is not crowded and the water quality is good. Big parking area at several spots of the beach. Coarse/fine yellow sand and a playground, showers and toilets. The old Parador, now a hotel belonging to the Island Council, is located on the beach and can be an option for eating. The beach is located between Puerto del Rosario and the Airport, and can be accessed by a duly signposted junction. It was awarded the Blue Flag in 2010-2011. Length / width: 500 m x 50 m approx.